Stauntons on the Green, Bed and Breakfast Dublin 2 is the city’s most exclusive 4 star Georgian Guesthouse is situated in a unique location overlooking picturesque St. Stephens Green in Dublin City Centre. This house is a fine example of Georgian elegance and style and is full of character and atmosphere. 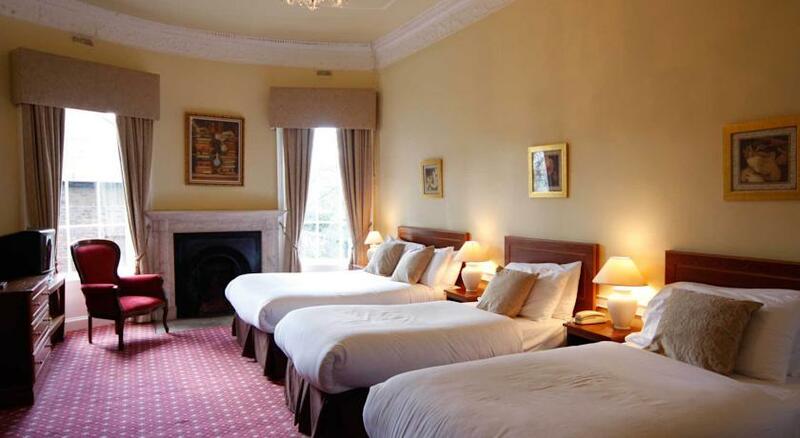 All of the bedrooms have either views of the fabulous Iveagh Gardens or of St. Stephens Green which is one of Dublin’s finest parks. The garden of Stauntons on the Green leads onto the Victorian Iveagh Gardens which is a gem well worth seeing. There is a choice of single, twin or double, triple and family rooms at Stauntons Bed and Breakfast. All rooms are ensuite with TV, Telephone, Hairdryer, free WiFi and Tea/Coffee facilities. Hot or cold Breakfast is included an there is a wide choice including porridge, a choice of eggs, fresh juices, or fruit. St. Stephens Green is one of Dublin’s most beautiful Parks with walks, trees, flowers, a lake with lots of birds, fountains and interesting sculpture. The College of Surgeons, The National Concert Hall, Trinity College and the St. Stephens Green Shopping Centre are no more than a 10 minute walk away.